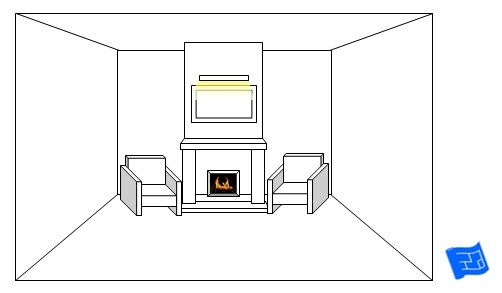 On this page you'll find simple drawings for living room lighting ideas. In those fancy decor pictures it's sometimes hard to focus your attention on the different layers of the lighting design. 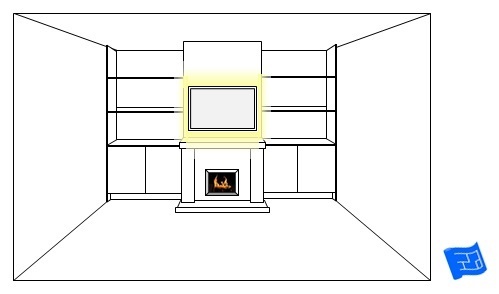 On this page, you can work through the ideas (and it's a long page because I've lots of ideas for you) and think about which lighting options you'd like to include in your living room lighting design. There's some real life lighting images at the bottom of the page. It's all part of the home lighting design series here on House Plans Helper. 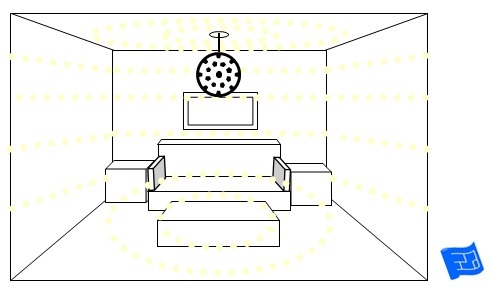 First of all, let's pause to think about the lighting requirements in a living room. 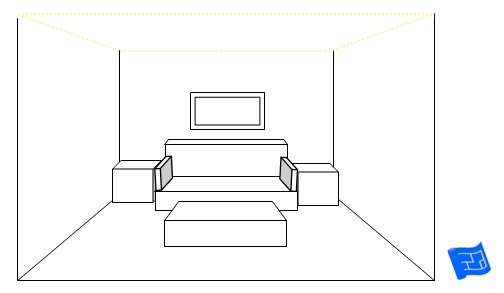 Apart from the need of general lighting when it's dark outside, what activities go on in your living room that should be taken into consideration? Maybe you relax, watch TV and read in your living room. Maybe you host a book club or a musical group. 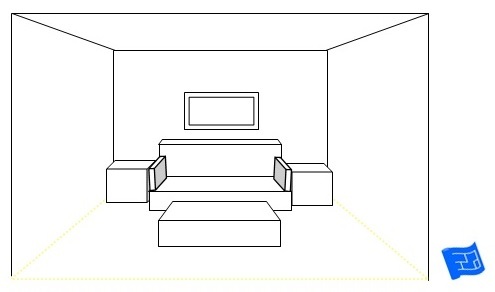 Think about all the different activities and what the lighting needs are. For relaxing think of ways that the lighting can add atmosphere into the room, or pick out special objects or works of art that you can admire. 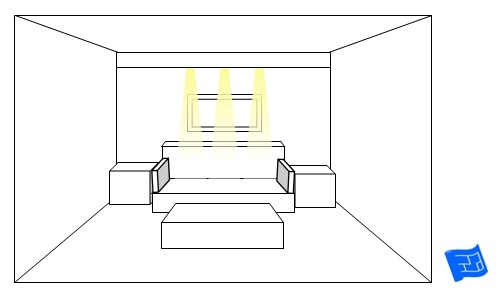 When watching TV, light the room to enhance the experience. Make sure there's enough light for reading in your favorite chair. You get the idea. 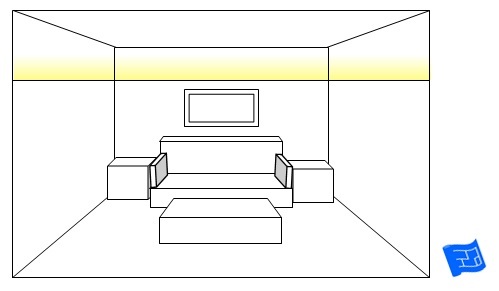 We'll look at feature, task and ambient living room lighting ideas. We'll start with the feature lighting options because they tend to be least obvious ideas and in my opinion, the most interesting. Obviously lamps don't have to be wired in but it's worth planning them into your living room lighting ideas so that you can make sure you have enough plug sockets in the right places. With really good planning, you can put in plug sockets that form a lamp circuit so that you can turn them all off with a switch on the wall. That saves a few steps every night walking round your room turning the lamps off. Lamps come in all shapes and sizes. Let's start with a lamp idea that adds atmosphere and a bit of personality. It's a floor lamp, but not in traditional sense. It stands on the floor, but it's not a tall lamp. 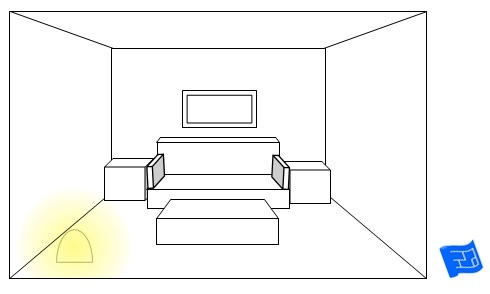 The light source is kept near the floor with the light inside a translucent shade that can take on various shapes. I think it's a bit like having a light pet. 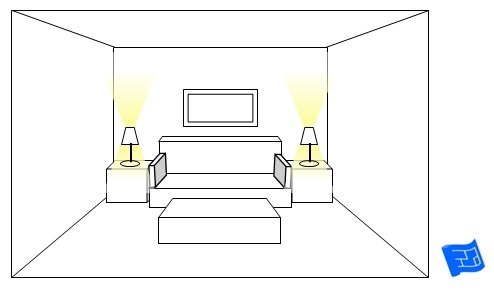 Here's another idea you can try with floor based lamps to create some dramatic lighting from behind an armchair or sofa. 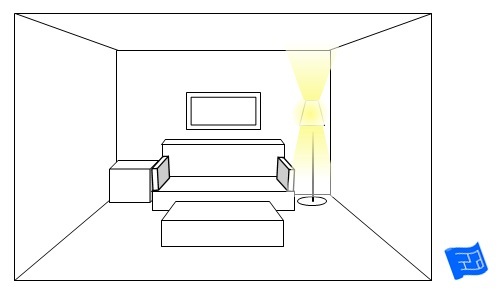 Again the lamp would sit on the floor behind your chairs and this time you need a lamp with a beam directed upwards. For even more drama you can use a lamp below a plant to throw a shadow on the wall. 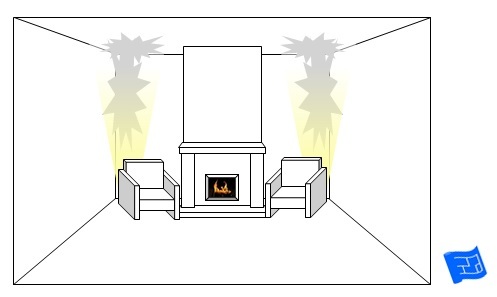 It's the last technique on the lighting design techniques page. If you have a lovely piece of art on the wall, make the best of it with a picture lamp. 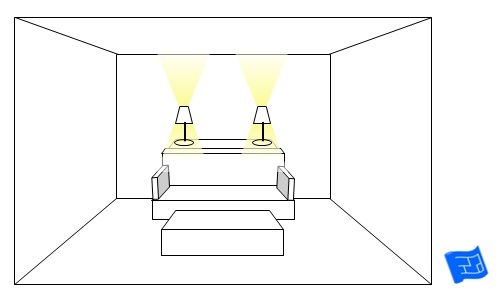 If the picture is above your sofa this light could also contribute to task lighting for reading. 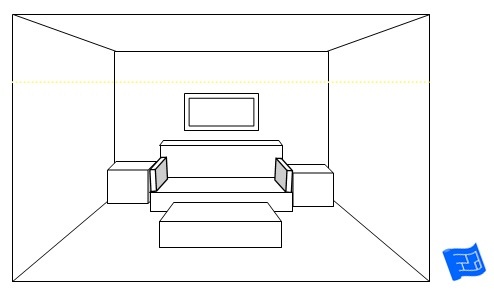 Many living rooms have shelves, maybe built-in, maybe free-standing. Here's some living room lighting ideas for your shelves. 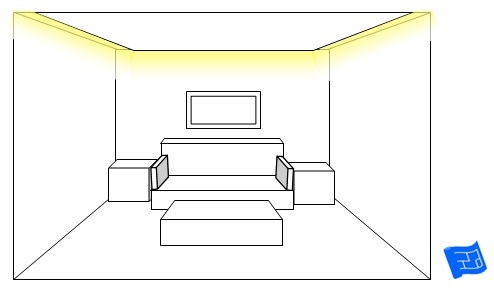 You can use LED strips or florescent tubes to create a downward glow. 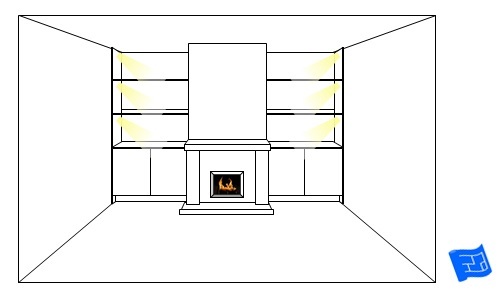 I've even seen strip lights installed directly behind shelves so that the glow is in both directions. Spotlights are another option and are especially effective lighting special objects. 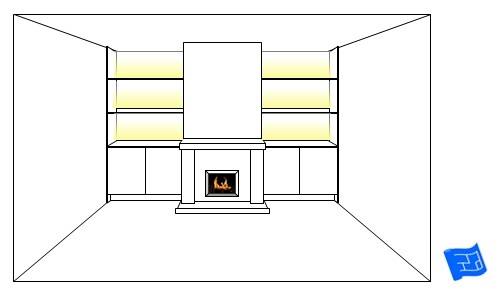 There's also light oozing out from under the cupboards in the image below. Here's spotlights again, but placed and angled differently. And, provided you've got a power socket in the right place and the right lamp, there's no reason why you can't put a lamp in your shelves. 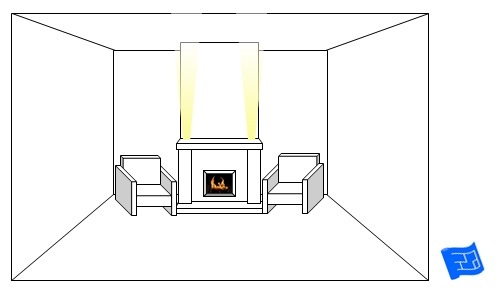 If you have a fireplace in your living room, here are a few living room lighting ideas for adding a bit of intrigue to your fireplace. You can show off your fire surround by installing small uplights in your hearth stone. Uplights can also work installed in your mantelpiece. 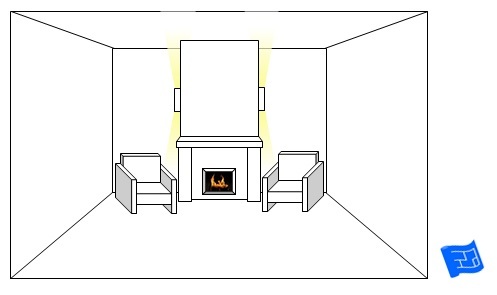 You can create a frame of light by using some uplights at the side of the fireplace. Wall sconces can be used to great effect at the front of the chimney breast. 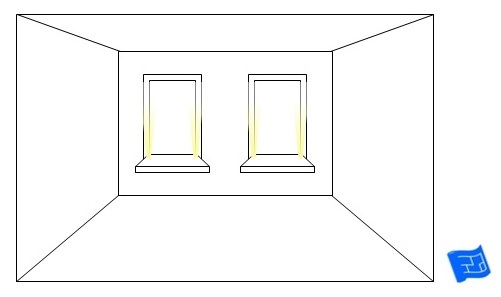 The sconces shown here have a very directional beam upwards and downwards. If you feel your chimney breast is too thin to wear the scones at the front, consider mounting them on the side of the chimney breast. If your chimney breast is textured a wall wash over the chimney breast can be very effective, from the bottom. 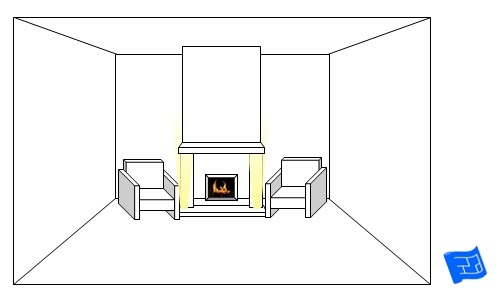 Or by inserting a coffer between the chimney breast and the ceiling to create a downward glow. Now here's something more traditional. The classic picture lamp is a great way to highlight a lovely painting or mirror. I think the chimney breast is a great place to hang an artwork. The fire is a natural focal point and a lovely picture. Now we move on to some living room lighting ideas involving windows and window treatments. Some of these ideas work well with different types of window treatment. Consider whether these ideas will work with what you have in mind - curtains, shutters or blinds. If you have curtains installed in a pelmet or in a coffer in the ceiling why not plan for a strip of lights to produce a lovely glow on the curtains. You can create an upward glow from the curtain pelmet and a downward glows from the window sill. Spotlights installed in the ceiling is a great way to create rhythm in the lighting scheme. Here's the same idea using two downlights per window with a narrower beam. 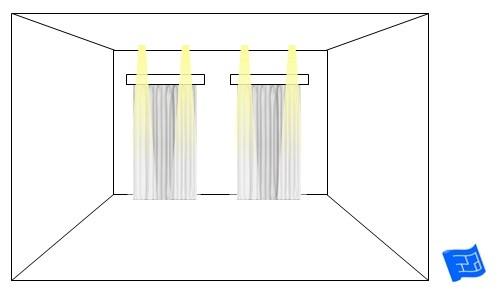 If you have blinds installed, installing lights in the window surround becomes a possibility. 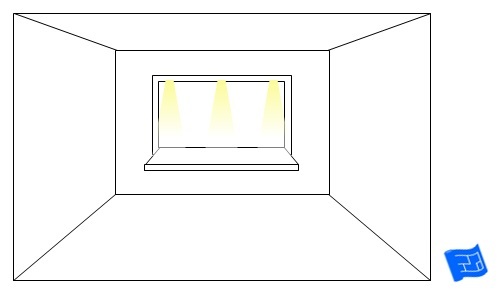 The lights need to be placed so that the blind is between the light source and the window. Here's some downlights which would highlight your blind and any object displayed on the window sill. 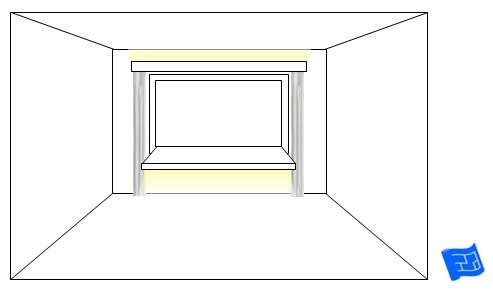 I've seen uplights in the window surround used to great effect in tall windows that have sills fairly low to the ground. When it's dark, the window lights bring the atmosphere of the room down to the eye level of sitting on the sofa making the space which feels tall and airy during the day more intimate at night time. I came across a house once where there was a light source in between the window pane and the blind. This created a lovely glow inside the room, and the blinds were translucent and had a motif sewn into them which was illuminated and added to the curb appeal of the house during night time. 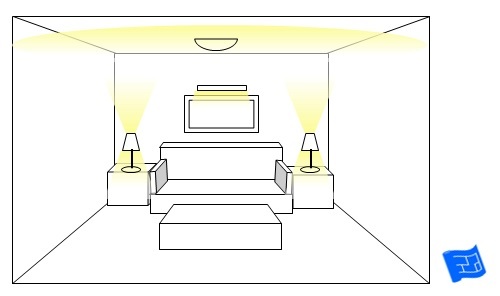 Believe it or not, the best lighting for watching television includes having a soft light source behind the screen. some TVs have backlighting built in. Rope lights are a great way of adding a little bit of sparkle to your living room lighting ideas. 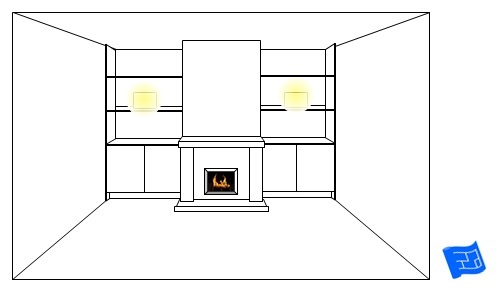 Here are three examples of rope lights installed in the wall at ceiling level, picture rail and floor level. No living room is complete without lamps. So here's a few living room lighting ideas involving lamps. Side table lamps are a great way to tackle the requirement for light for reading and to add atmosphere. Here's a set with solid shades. Have a think about the shade. You can find solid shades, translucent shades that create a glow, or even shades that case a pretty shadow. Look out for lamps that can be dimmed or have different light level settings. Then you can have them on bright when you want to read, and down low when it's a calm ambiance that you're after. This trend of hanging your reading lights from the ceiling seems to be catching on. 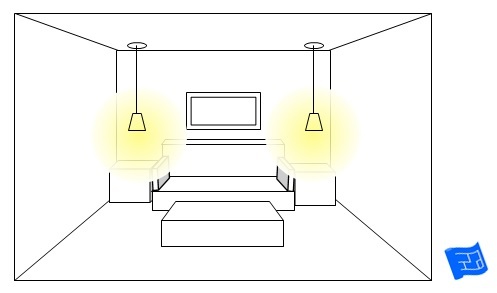 The only thing is if you want to change the width of your sofa or the layout of your living room, you'll have to re-do the lighting. I am a fan of two lamps on a sofa table behind the sofa. A tall floor lamp is another great solution to task and ambient lighting. If you're planning on providing your ambient lighting with a central ceiling fixture, take a look at these living room lighting ideas for ceilings. Ain't nothin' wrong with a good looking ceiling globe. This is a great option if you don't have a huge amount of ceiling height to accommodate a pendant fixture. Here's a pendant fixture with shade in its most basic form. 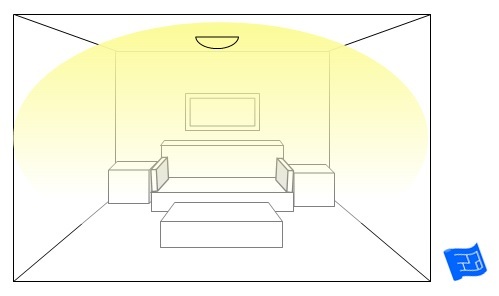 Consider getting a shade with one of those translucent discs that sits at the bottom of the shade and hides the light bulb from view. This shade is a bit more exciting. Find a shade with cut outs or crystals which will cast an interesting dazzle around your living room. 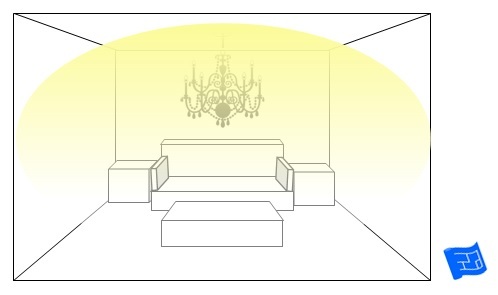 If your living room has the right proportions for it, try a chandelier. Will a chandelier suit your living room? I am a big fan of playing with the ceiling to create beautifully atmospheric lighting effects. Here's a dropped ceiling with light creeping out from around the edges. And here we have a coffered ceiling offering a gentle glow from above. And downlights area great way to introduce a bit of rhythm into your ceiling lighting. 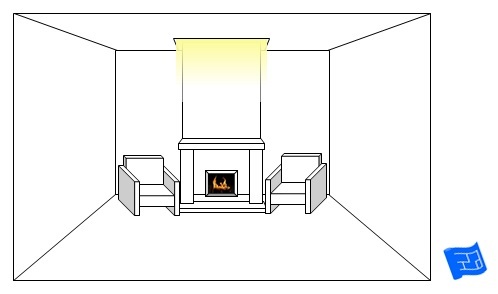 It's a little strange to put a lamp in the section on ceiling living room lighting ideas but a tall lamp with an upward pointing beam means most of the light reflects off the ceiling. 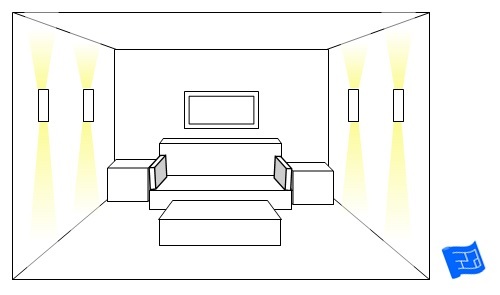 It's an interesting option to think about because you can try it at different places in the room and it's an inexpensive way of adding a bit of interest to the highest lighting layer. Nearly there. This is the last section of living room lighting ideas. I like using wall sconces. Generally most of the activity that goes on in a living room involves sitting so it's nice to bring the light level down a bit. Having light fixtures on the walls means you can admire them more easily as they are in view without craning your neck towards the ceiling. Here's three options with different shaped sconces. Another alternative is to install lighting in a picture rail. Could picture rail lighting be right for your living room? 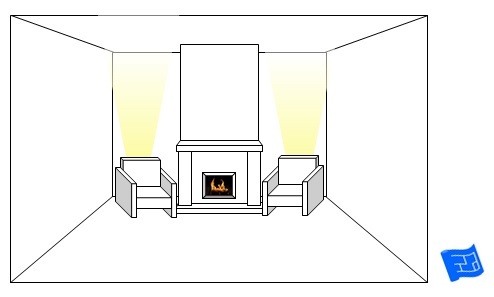 It might seem strange to put this lighting arrangement with downlights from a baffle in the ceiling into the section on wall based living room lighting ideas but these downlights are illuminating the wall, so the light reads as if it's from the wall rather than the ceiling. Phew - that was a long page. 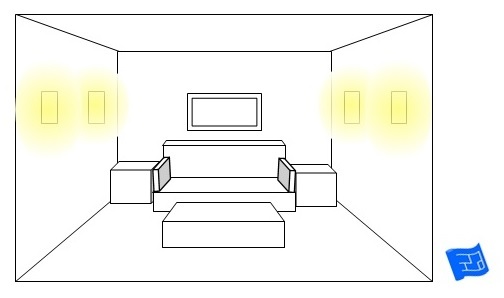 Now it's time for me to share my Houzz living room lighting ideas ideabook with you. 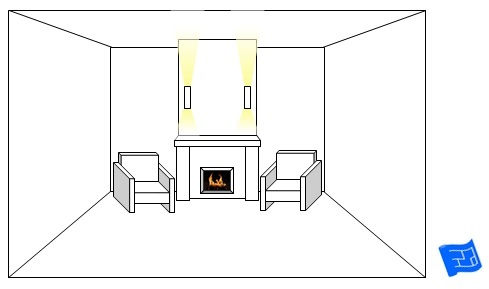 I've collected together some real life examples to illustrate some of the lighting options we've looked at on this page.